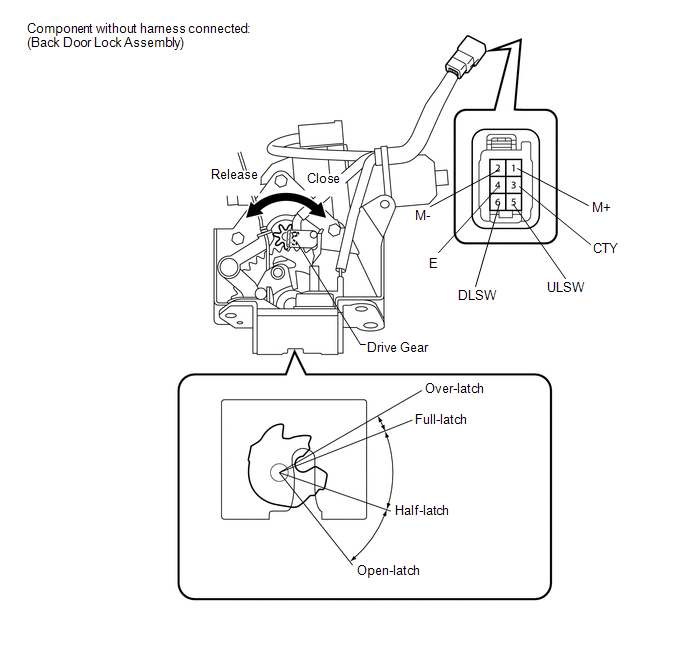 When the back door closer does not operate, one of the following may be the cause: 1) improper fit of the back door, or a foreign object is stuck in the back door or 2) initialization of the power back door ECU (power back door motor unit)*1, or a malfunction in the 3) power back door ECU (power back door motor unit)*1 or back door closer ECU (multiplex network door ECU)*2 power source circuit, 4) back door lock circuit, or 5) power back door ECU (power back door motor unit)*1 or back door closer ECU (multiplex network door ECU)*2. 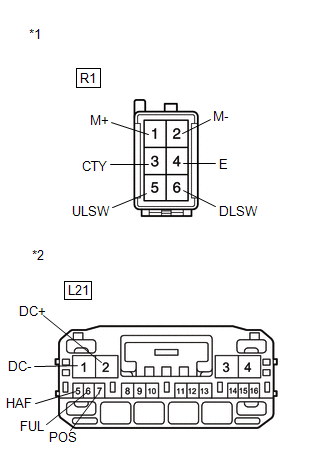 Inspect fuses for circuits related to this system before performing the following inspection procedure. (a) Check if the back door is fully closed by hand. 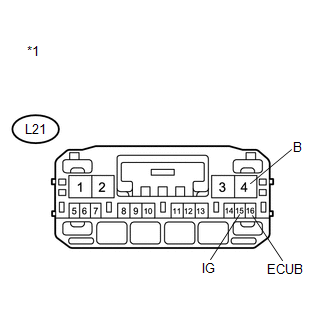 (a) Perform the initialization of the power back door ECU (power back door motor unit) (See page ). (a) Check back door closer system operation. Back door closer system operates normally. 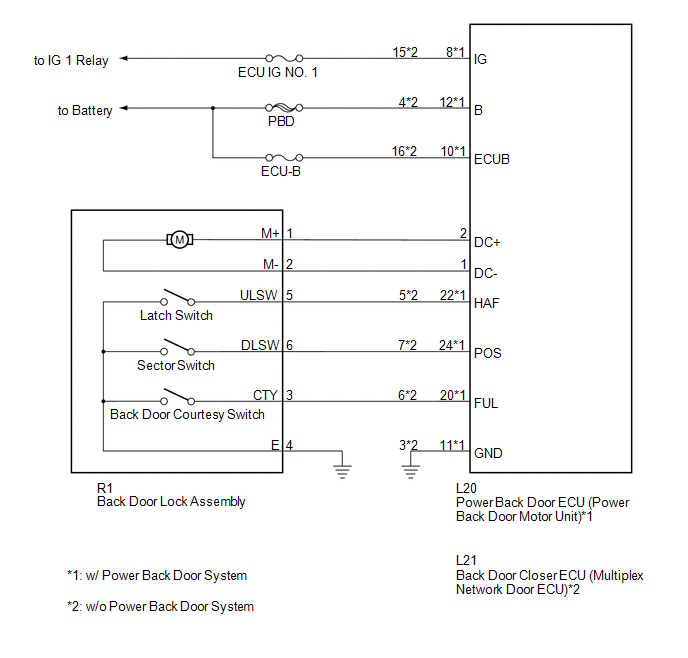 (e) Check the Data List to determine if the power back door touch sensor functions properly. 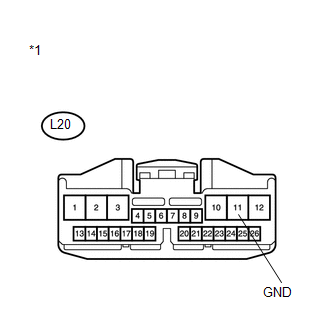 The power back door sensors function as specified in the normal condition column. (d) Enter the following menus: Body Electrical / Back Door / DTC. 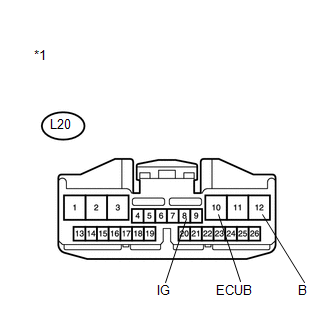 (1) Disconnect the L20 power back door ECU connector. (2) Measure the voltage according to the value(s) in the table below. 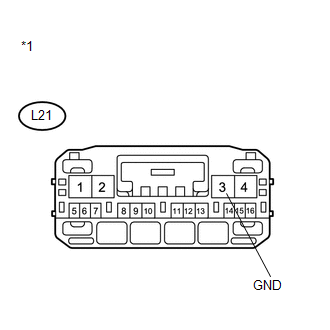 (1) Disconnect the L21 back door closer ECU connector.